NXT Champion Andrade "Cien" Almas and our favorite underdog Johnny Gargano put up a 30-minute clinic on how title matches should be done, while cementing their status as two of the best workers in the company right now. 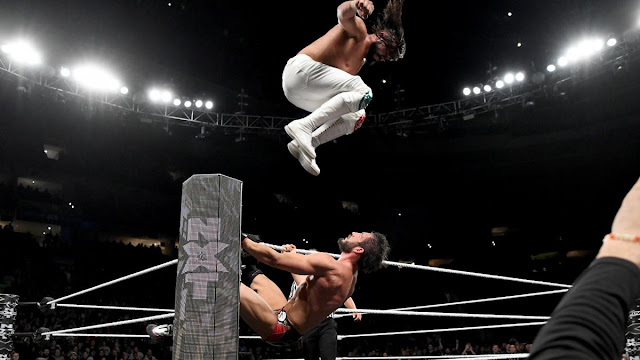 Almas and Gargano have impeccable chemistry, as evidenced by their two previous matches. It was an odd pairing for me back then, but they proved me wrong at TakeOver: Brooklyn III and on NXT TV. But surely, this match for the title is one of the best in NXT, heck maybe even one of the best in WWE in the past decade. This was what we meant whenever we say that professional wrestling is an art form. Everyone wanted Gargano to win badly. Who didn't? He's the modern-day Daniel Bryan: the beloved underdog who weathered the storm to prove the naysayers wrong. Except that this wasn't his time yet, and for all the right reasons. There are still so many stories that should be told with a chasing Johnny Wrestling. There's still the looming threat of his former tag team partner Tommaso Ciampa (THAT SNAKE) who will likely haunt him for the next few TakeOvers (come on, their story is too good to last only until TakeOver: New Orleans). It was painful to see him lose, but I know things will only get better for Johnny Wrestling from here on. And when he wins the big one, it's going to be glorious (pardon the pun). We should include El Idolo in the conversation, too. He was overlooked in the past two years he's been with NXT, despite being a consistently solid worker. Now that they have finally found the missing piece of the puzzle in Zelina Vega, they both deserve more time in the spotlight. From a directionless midcarder, Almas has now become a vital part in the resurgence of NXT. All those years of looming in the midcard purgatory may have damaged Almas, despite already being the champion, so I hope that they continue allowing him to have MOTY contenders every TakeOver because he is capable of doing it. And boy, what a pool of potential contenders he's going to have. Thank you, Based Haitch. Thank you, Based NXT. Undisputed ERA (Bobby Fish and Kyle O'Reilly) def. Authors of Pain (Akam and Rezar with Paul Ellering) to retain the NXT Tag Team Championship: I wasn't expecting this to open the show, but I'm glad that it did. As (damn good) smarmy heels, I sometimes forget that the duo from the ERA are one of the best tag teams, and they reminded me in this match. This was a typical David-versus-Goliath match, where the smaller team utilized their submission and striking game to take down the much bigger opponent, and it was an enjoyable one. I'm not quite sure though what to make of AOP's post-match moments in the ring, but Paul Ellering's boys have indeed improved a lot, and the sky is the limit for them. Velveteen Dream def. Kassius Ohno: This was the weakest match in this show for me, but it was still okay. I found that the real highlight of this match is how much further Creative and Patrick Clark are pushing the walls of a gimmick that looked like it was doomed to fail. Case in point: Dream came out wearing boxing trunks that donned the faces of his opponents and Muhammad Ali, with the promise of knocking out the Knockout Artist in less than 30 seconds. As for Ohno, sure, I guess this gatekeeper role is what he wants, but if he keeps on losing high-profile TakeOver matches, I worry that he might lose credibility eventually. He has to win a TakeOver match at some point. Ember Moon def. Shayna Baszler to retain the NXT Women's Title: I really liked the finish to this one, and I guess this is the epitome of NXT's smart booking. Despite still looking like a legitimate badass after her match, Shayna's toughness and aggression were still her downfall—just like her match with Kairi Sane at the Mae Young Classic—and the continuity is very much appreciated. They still have a lot of points for improvement (Shayna's wrestling is one), but Ember's character was a bit more on point here, with her looking more intense than usual. Aleister Black def. Adam Cole (baybay!) in an Extreme Rules Match: MAN, THE BUMPS THEY TOOK IN THIS MATCH. This was the match that I was most excited for because the mere fact that Adam Cole and Aleister Black were in an Extreme Rules match intrigued me. Then I remembered that Cole's roots were in CZW (Combat Zone Wrestling, the same promotion where Dean Ambrose came from), so it was a nice callback of his extreme side. Despite the presence of weapons, Black and Cole reminded us how good they are with wrestling, and the risks they will take for our entertainment. Black and Cole weren't also put in this stipulation just because. Both men have been the thorn in each other's sides in their pursuit for the main event spot. The interference of Cole's cohorts from the Undisputed ERA and SAnitY weren't just for overbooked chaos, either. All these have bases, thanks to NXT's solid storytelling. With Aleister Black's win, I expect him to be Almas' next challenger, and rightfully so. It will be an interesting clash of characters and styles. As for Cole, he and the Undisputed ERA have a beef to squash with SAnitY. But surely, an NXT title shot soon is very much possible. Their dizzying camera work and the notable absence of Nigel McGuinness on commentary aside, TakeOver: Philadelphia was a really good show from top to bottom. We have yet to see a disappointing TakeOver show, and it's a testament of how far solid workers and storytelling can take everyone. It deserves an A.